The Gang of Twelve was in the house. The Big Three, Peter, James, and John, Mary the Mother of God, Matthias, the newly ordained Apostle, and 120 disciples waited on the Lord to produce what he promised: the coming of the Holy Spirit. For fifty days following the Resurrection members of the Way, as the Christian movement was then known, sweated it out in a room on the top floor of a house owned by Mary, the mother of Saint Mark the Evangelist. The first G-12 summit. It was in that room that Jesus and his friends celebrated the feast of Passover, where he instituted the priesthood, consecrated the Eucharist (Jn 13:1-20; Mk 14:22), and established the Church. Well the Apostles remembered what Jesus told them before he ascended to heaven: “Wait in Jerusalem for the gift that my Father promised, the gift of which I told you. John the Baptist baptized you with water, but soon you will be baptized by the Holy Spirit and fire” (Acts 1:5). Baptized by the Holy Spirit and fire?—what could that mean? The hog was in the tunnel; the message from heaven was clear: the disciples were to carry on the mission issued by the Lord, to go into the world and baptize every nation (Mt 28:18-19; Mk 16:15). This happened between Easter and Pentecost. 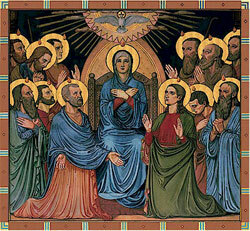 Pentecost in the Christian tradition is the day that the Lord sent his Holy Spirit to sanctify the Church. Fifty days ago we celebrated Easter, Christ’s resurrection from the dead, the culmination of the Paschal mystery that began during Holy Week. Like God the Holy Spirit is eternal and continues to work in the minds and hearts of believers. We’re getting ready for the feast. Members of the new house-Church at Jerusalem felt apprehensive but had little reason to doubt. After three years with Jesus during his ministry on earth they grew accustomed to the supernatural. He healed the sick, raised the dead, cured lepers, and drove the darkness from the minds of the possessed. And he rose from the dead. Was there anything that Jesus couldn’t do? Through the windows the Apostles listened to the shouts of revelry—a cacophony of languages—throughout Jerusalem. In those days Pentecost was a week-long celebration to commemorate the night that God handed down to Moses the Ten Commandments on Mount Sinai (Ex 191ff). Pilgrims from throughout the Greco-Roman world, from surrounding towns and villages, and as far away as India and Spain crammed Jerusalem’s narrow streets and markets. The prophet Isaiah wrote, “All nations shall stream toward Jerusalem” (2:2-3) and now they had arrived. Paul the Apostle, formerly known as Saul of Tarsus, was just another face in the crowd, elbowing his way through the masses that morning toward the Temple to participate in the nine o’clock hour of prayer. The Apostles dared not show their faces for they were hunted men. They hunkered down because the Jewish authorities were seeing red. It was best that the Boys remained underground despite how much they loved to party. God had more in mind for them than wine and barley sheaves: the coming of the Day of the Lord into the world once more, a must-see rerun episode of Salvation History. Pentecost, ancient Greek for “fiftieth,” began as an agricultural feast dating back to the era of the Exodus, held on the fiftieth day following the annual grain harvest, a perpetual memorial to be celebrated gratefully for the bounty of the Lord (Lv 23:15; Dt 16:19). By the time Jesus was born Pentecost had morphed into a celebration marking the giving of the Law—the privileged communication of God’s Word—fifty days after the sacrifice of the paschal lamb that marked the deliverance of the Jews from the Egyptians: the Passover. Twelve centuries later Pentecost as described in the First Testament sealed the deal for the Lord chose the Israelites to be “a chosen race, a royal priesthood,” God’s favored people (cf 1 Pt 2:9; Ex 19:6; Rv 1:6; 20:6) just like us today. The Bible tell us that the coming of the Spirit happened at nine a.m. Great masses journeyed to Jerusalem to worship God in his holy court. The disciples wished to join the festivities but Jesus gave them marching orders to halt. Saint Luke the Evangelist, a Greek physician from the Roman province of Syria, wrote about this watershed moment in his best-seller The Acts of the Apostles ( AD 75). The Holy Spirit rocked the house. Cool bluster blew the curtains, knocked out the windows and extinguished the hearth. The Apostles knelt with their arms open to welcome the Spirit. Others prostrated. Still more hid their faces with their prayer shawls for great fear fell upon them. The influx of the Spirit imbued them with an understanding of everything Jesus taught them. Spirit transformed them into the new Twelve Tribes of the recreated Israel. They remembered the poem of the psalmist—“Lord, send forth your spirit, and you will renew the earth” (Ps 104:30)—and believed the Word. The wind died away. The apartment grew quiet. Nobody dared to speak but then they noticed the fire. A gleaming flame spread below the ceiling and as they watched the fire separated itself into individual flames that floated through the air and came to hover over the heads of everybody in the room. What’s up with that? they thought. Flashback to Sinai. Fire symbolizes the presence of God. The sound from heaven filling the house was like the earthquake during the great theophany—the supreme God moment—in the desert. Israel formed the basis for hope in the God for all people. A trumpet blast from the angel summoned the Israelites to the base of the mountain where they stood in awe and pledged allegiance to their Master. God’s special appearance, a one-night-only performance, was an experience that the Israelites never forgot, not even during Jesus’s day. Neither should we. God isn’t done saving the world. He needs our help. Fast-forward to Jerusalem and the upper room where things grew stranger still. Again Saint Luke: “Now there were devout Jews from every nation staying under Jerusalem. At this sound, they gathered in a large crowd, but they were confused because each one heard them speaking in their own language” (Acts 2:5-6). Like sprites Christians streamed from the house praising God with strange words as the Spirit gave them the ability to speak. Their voices echoed throughout the Temple district and astonished the crowds. Incredulity. Anger. Envy. Pilgrims hemmed them in on every side. Who did they think they were, these Galileans? Some spoke the language of the Babylonian. Some canted psalms in ancient Greek. Others prayed in elegant Ciceronian Latin. Truly a sight to behold and to hear. Speaking in tongues was no mere psychobabble. In fact it was biblical prophesy: “I will pour out my spirit. … Your sons and daughters shall prophesy, your old men shall dream dreams, your young men shall see visions.” Thus says the prophet Joel (3:1-2). This truth wasn’t lost on the disciples. In fact, it was their truth, the very act that the Spirit prepared them to do. No time to waste. Time to work. No sense in complaining when you’ve got a job to do. THESE MEN ARE NOT DRUNK! Bystanders scoffed. “These men are drunk!” Paul laughed off their charade, never tolerated glossolalia (speaking in tongues) in his church and admonished its members. “So if the whole church meets and everyone is speaking in tongues and then the uninstructed Christian or unbeliever should come in, will they not think that you are out of your minds?” (1 Cor 14:23). Maybe they were. Crazy from the heat. It is said that when the going gets weird the weird turn pro and so these pros from Dover became professional evangelizers on the spot. If you’re going to be crazy then you have to make a living at it otherwise they’re going to lock you up. A distinct possibility for the Gang of Twelve and their ilk. “It is impossible for us not to speak of what we have seen and heard” (Acts 4:20). On this the day of Pentecost, when the seven weeks of the Easter Season have elapsed, Christ through his Resurrection confers upon believers the living Spirit. Christ Jesus, crucified and risen, pours out his Spirit in abundance to all who would receive him (CCC nos. 2623, 767,1302). How could we refuse? It is the Spirit who gives life and the words that Jesus has spoken are words of Spirit and life (Jn 6:63). Peter, on his knees after partaking of the Eucharist beseeched him saying, “Lord, to whom shall we go? You have the words of eternal and life. And now we know, and are convinced, that you are the Holy One who has come from God” (Jn 6:68). He did not say this on his own but as de facto leader of the G-12 Summit he prophesied the truth of the Spirit in the life of the Church.